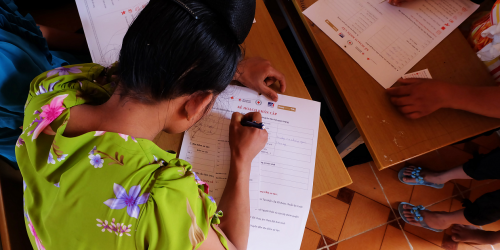 Despite living in a natural disaster-prone area, the local communities of Northwest Vietnam do not have access to knowledge and skills needed to proactively protect themselves and their assets. Therefore, the awareness-raising campaign “For a Safe Community” is essential to support these populations to learn how to prepare for, prevent and respond to natural disasters. 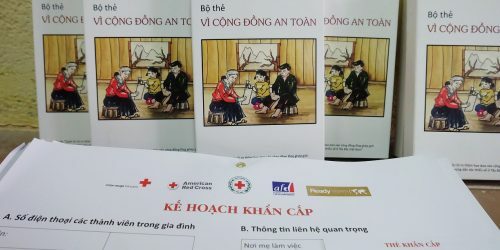 The campaign will be taking place from March to June 2017 in the framework of the “Gender-sensitive community-based disaster risk management project in ethnic minorities’ areas of Northwest Vietnam” implemented in Son La and Lai Chau by the Vietnam Red Cross with the support from the French Red Cross, the American Red Cross and the Agence française de Développement (AFD). The local context is challenging for this awareness-raising campaign. In these mountainous areas, the majority of the population is illiterate, there is no knowledge of Vietnamese national language and means of communication are very limited. The campaign “For a Safe Community” addresses these issues by developing suitable awareness-raising tools for the target audience and applying participatory methods via village meetings. By choosing the direct channel to communicate, the campaign started with organizing trainings for facilitators-communicators to be messengers of knowledge towards the population. The facilitators-communicators consist of Red Cross staff and volunteers, Women’s Union staff, Youth Union members and/or village chiefs, who were energetic and capable of speaking both the Vietnamese national language and the local one(s). Through the training, they were equipped with the knowledge and skill to communicate and transfer it properly to the local community. During the trainings, those facilitators-messengers were provided with some knowledge on common/frequent disasters in their living areas, were trained on basic communication techniques, and could immediate put in practice in their communities what they have learned. The facilitators-messengers are using a toolkit which was specifically developed for this Project’s target audience. The toolkit uses symbols and pictures that enable local community, to (1) understand what should be done and not be done before, during and after natural disasters and (2) learn how to develop an Emergency plan and an Emergency card (wallet-size, mentioning all the important contacts and an action plan to respond to disasters). Moreover, especially designed to promote people’s participation through group activities and games, these tools make the awareness-raising session more efficient and allows participants to gain interesting knowledge, easy to understand and remember for longer. 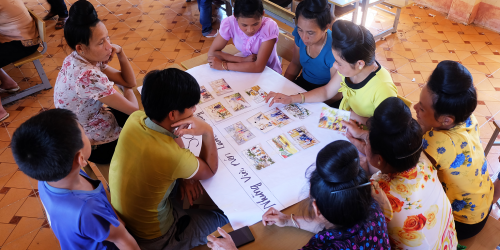 Vietnam where women are often disadvantaged with regards to accessing information and participating in (and getting benefits from) community’s activities, both contents and visuals of the toolkit also consider gender issues. All tools and documents consider the basic needs of women and aim to facilitate women’s participation. The pictures used challenge the gender bias by showing women and men working together, and women carrying out tasks what are traditionally thought to be men’s jobs and vice versa and in projecting an active and positive image of women. Besides, the awareness-raising campaign aims to train facilitators-messengers on engaging women and encouraging them to raise their voice. The campaign has brought up a number of real positive results. The survey has showed that thanks to appropriate adapted methods and the facilitators-messengers’hard work, the local populations could all understand the awareness-raising messages’ content and commit to carry out what they have learnt. Those reserved women from ethnic minorities participated actively and happily in the communication sessions. “What I liked the most in the communication session is the pictures. They are very easy to understand. I also like discussing with other people. It (the team activity) was very fun,” – said Mrs. Lo Thi Khoa, Pu Nau village, Thuan Chau district, Son La province. “For A Safe Community” is one of the first awareness-raising campaigns about disaster risk management conducted in Northwest Vietnam. The awareness-raising toolkit was developed in order not only to serve the project’s objectives but also to be shared with relevant partners interested in using it within other similar projects. It aims to continue contributing to the sustainable development of safer Northwest areas.